Download the Twitter installation file. After the installation process is complete, click Close. The Twitter connector is displayed in the ElastiCube Manager under Add Data > Web Services. Before requesting data from Twitter, you must apply for access to your data from Twitter by submitting this request form. As part of your request, you must provide your APP ID. Click here for instructions on how to find your APP ID. After you have created a Twitter app, you can manage it here. This is useful if you need to set permissions so you can access the relevant data. In ElastiCube Manager, click Add Data and then, Twitter. The Connect to Twitter window is displayed. Click Connect to Server. You are redirected to the Twitter Login page. Log in with your credentials. 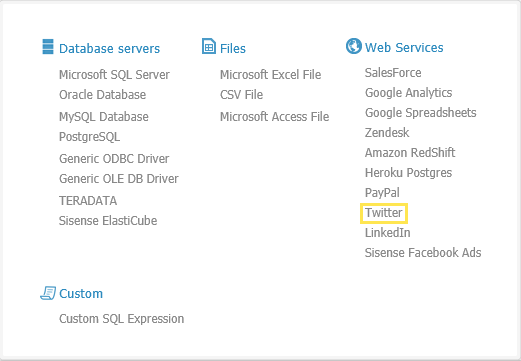 Twitter is displayed in the Select Database list in the ElastiCube Manager. 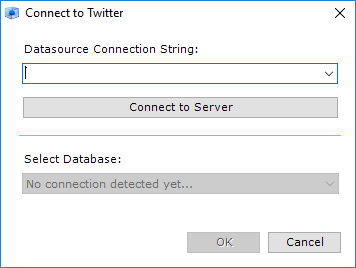 Click OK. Sisense connects to Twitter and displays a list of tables available for you to import. Select the relevant tables and click Add. The tables are displayed in the ElastiCube Manager. The Sisense Twitter connector allows you to import the following tables into the ElastiCube Manager. DirectMessagesReceived Query and delete direct messages received by the authenticated user. DirectMessagesSent Send direct messages and query messages sent by the authenticated user. Favorites Create, delete, and query a list of favorite tweets of the authenticated user and allow the user to favorite new tweets or remove existing favorites. Following Create, delete, and query a list of users that the current Twitter account is following, otherwise known as friends. Tweets Create, delete, and query status updates and tweets from the authenticated user. AccountSettings Query account settings about the currently authenticated user. AdAccounts Retrieve all of the advertising-enabled accounts the authenticating user has access to. AdAvailableAudiences Query available audiences for this account. AdCampaigns Retrieve details for some or all campaigns associated with the current account. AdFundingInstruments Retrieve some or all funding instruments associated with the account specified in the path. AdInsights Provide qualitative information about various Twitter audiences. AdLineItems Retrieve some or all funding instruments associated with the account specified in the path. AdPromotedTweets Retrieve all of the advertising-enabled tweets the authenticating user has access to. AdStats Query information about all available metrics for a certain entity. Followers Query a list of users following the current Twitter account. ListMembers Query the members of a specified list. Lists Query Twitter list information based on a set of criteria. ListSubscribers Query the subscribers to a specified list. Mentions Query a list of retweets of the authenticated user. Retweets Query a list of retweets of the authenticated user. Trends Query the daily trending topics from Twitter. Users Query a list of users based on the SearchTerms, Id, or Screen_Name. OAuthClientId: Set this to the consumer key in your app settings. OAuthClientSecret: Set this to the consumer secret in your app settings. CallbackURL: Set this to the callback URL you specified in your app settings. InitiateOAuth: Set this to GETANDREFRESH. You can use InitiateOAuth to avoid repeating the OAuth exchange and manually setting the OAuthAccessToken and OAuthAccessTokenSecret. Enter the name, description, and website to be displayed to users when they connect. Define the callback URL setting.If you are making a Web app, set the callback URL to the URL you would like users to be returned to after they have granted your application privileges.If you are making a desktop application, set the callback URL to http://localhost/. Once you have created the app, you will be redirected to a page with information about your app. If you intend to communicate with Twitter only as the currently authenticated user, then you can obtain the OAuthAccessToken and OAuthAccessTokenSecret directly from this page on Twitter. The OAuthAccessToken and OAuthAccessTokenSecret are listed under the OAuth Settings in the Your Access Token section. You can then connect by setting these connection string properties and do not need to continue to the other steps. Otherwise, if you need to generate access tokens for other user accounts besides the one you used to create the app on Twitter, use the consumer key and consumer secret in the following steps.